Factor chain Euro Car Parts has acquired trade counters in Scarborough and Normanton, Wakefield. The acquisition was completed on behalf of American commercial real estate broker Cushman & Wakefield; however, terms of the deal were not disclosed. The Scarborough site is now open on Seamer Rd between Howdens and Toolstation, housing 17 staff and six delivery vans within its 3,356 sq ft warehouse. Meanwhile, the Wakefield branch will open in due course on Good Hope Close, located off Pontefract Rd near Junction 31 of the M62 motorway. Large German factor Stahlgruber combines robotics and logistics in hub reboot. CAT contributor Alan Smithee gets the latest. How about this for a warehouse upgrade? 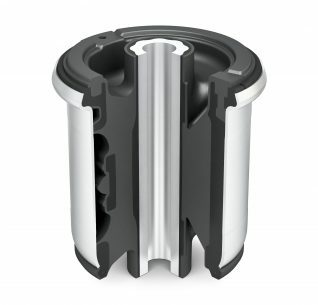 German motor factor Stahlgruber needed to expand and in typical fashion, bosses at the firm put their minds to achieve the most efficient solution possible. What they came up with was a completely robotic 23,000 sq. ft extension, connected to the existing facility by a 60-metre bridge with a pallet conveyor. Working with warehouse automation firm TGW Logistics, the firm built the new new automatic ‘mini-load’ warehouse and the entire conveyor system for plastuc crates known as ‘totes’, roll containers and pallets, plus the storage and retrieval machines. TGW was responsible for the design and installation of the pallet conveyor and storage and retrieval equipment in the receiving area. The new 26-metre-high automatic mini-load warehouse consists of two storage levels with nine aisles each, and two separate storage and retrieval levels serviced by machines. ‘Twister’ load handling devices transport the goods to and from 165,800 storage locations at rates of up to 118 movements per hour, with each unit identified by barcode and tracked on Stahlgruber’s computer system. As part of the new facility, TGW built a new receiving terminal that makes the best of the received goods’ travel through the logistics centre. Modifications to the existing pallet handling system means suppliers now deliver all pallets pre-labelled with a barcode indicating the shipping unit. On receipt in pallets or grid- boxes, items are routed either directly to the existing pallet warehouse over the bridge via conveyor; to eight picking stations for direct picking from pallet; or to 44 decanting workstations connected to the tote conveyor system for unpacking the pallet into the tote crates. A display at each decanting station informs the employees about the required number of items to put into a provided empty tote, which is then transported to the automatic mini-load storage warehouse. The existing warehouse has also been redesigned with ‘ergonomic’ workstations for receiving, repacking, picking and shipping areas, with everything to hand and technology measuring weights etc in order to provide the best possible conditions for the employees. There is little need for employees to walk very far at all in fact, as the facility has four kilometers of conveyors whizzing totes and pallets wherever they need to go. 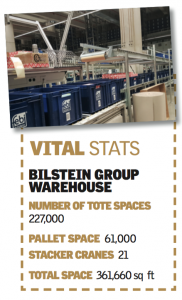 Bosses reckon on employees picking 210 totes per hour. The same picking stations also pick from full pallet loads delivered directly from the receiving area via TGW pallet lifts and a double transfer car. TGW also added a new shipping line to the shipping area and expanded the dispatch sorters. The changes to the twenty-year-old conveyor system in the shipping area increased performance significantly and dramatically reduced the noise emissions. The logistics centre now holds over 155,000 SKUs, with up to 100,000 orders leaving each day in a two-shift operation that provides customers with fast, accurate deliveries. Is this an exciting future, or are robots threatening the way we work? Why not email CAT and let us know your views. ‘Mini-Load’ systems, so-called because they use small crates called ‘totes’ in conjunction with a tall and fast robotic picking known as Automated Storage and Retrieval. When used with other systems mentioned, they can increase space utilisation by 90 percent, productivity by 90 percent and throughput up to 750 lines per hour. Who wouldn’t want that? 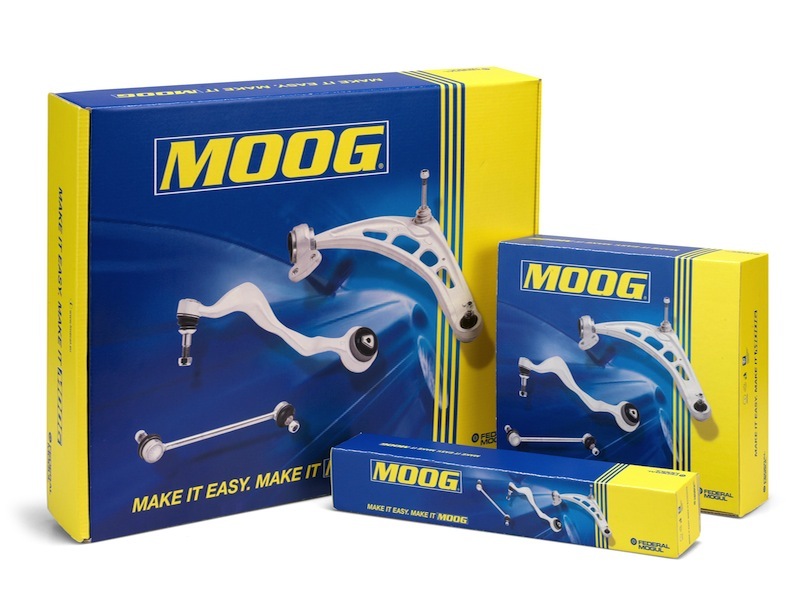 Three aftermarket firms have added to their networks. 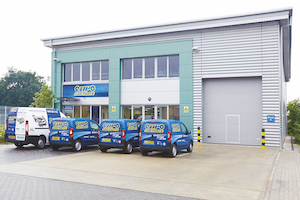 ■ Factor chain Euro Car Parts has agreed a ten-year lease for its new 20,700 sq ft warehouse, situated at the Cross Green Industrial Estate in Leeds. The location overlooks Pontefract Lane (A3), providing connections to the East Leeds Link Road and direct access to Junction 45 off the M1. “We are pleased to have secured Euro Car Parts as a tenant for this highly prominent scheme”, said Mike Baugh, Senior Director of Industrial Agency at CBRE Leeds, “Solvgrin [the site developer] has constructed a very attractive unit at this gateway to Leeds”, adding that the organisation will construct a further 6,000 sq ft industrial unit adjacent to the supplier’s facility. 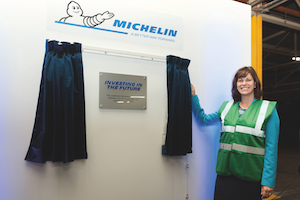 ■ Tyre brand Michelin has invested £10m for its logistics operation in Stoke-on-Trent, with the opening of a new distribution centre in July. The upgrade also includes a new distribution centre for ATS Euromaster – where both units will store and deliver up to five million tyres between them per annum. The two sites combined have doubled its logistics team to around 150 staff in order to satisfy this growing demand. Richard Whitehurst, Service to Customer Manager at Michelin Tyre, said. “The transformation of our logistics operation will allow us to improve service and ensure greater product availability”. 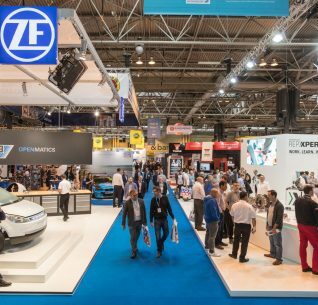 In addition to this, the firm is stepping up manufacturing capacity at its Campbell Road headquarters in Stoke-on-Trent by launching another tyre production facility. The warehouse will open at the end of November allowing the manufacturer to produce up to 1,100 tyres a day. ■ Meanwhile,Ecobat Technologies has moved to a 15,000 sq ft premises in Bristol. “We needed to move to a property that will allow the business to continue to develop and provide support for our customers” concluded a statement from the firm. You can’t read a press release in 2017 without mentally editing out buzzwords such as ‘lean’, ‘just in time’ and ‘finding efficiencies’and in some ways you can see why. In these times of giant trading groups and service in which next day delivery might as well be a month, if your business involves pushing boxes, then you need to find the best way to do it. For the Ferdinand Bilstein Group in Germany this meant automation. 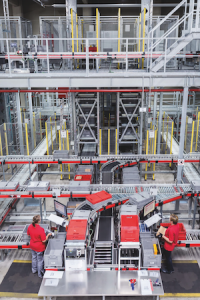 While it is based on or around the site on which it was founded in Victorian times, there is nothing old fashioned about the firm’s main logistics hub in Ennepetal, Germany as it features a huge and fully automatic plant building to store and push out in the region of 130,00 SKUs every day. Efficiency was clearly the deciding factor when the firm chose to build an automated warehouse, but it is also worth noting that Ennepetal is very hilly so physically building a manual-pick warehouse with the capacity that the firm needs would be very difficult as a great deal of extra land is needed to make up for the lack of height. A deal was done with a firm called Witron Integrated Logistics Corp., headquartered in Parkstein, Germany to develop and act as contractor to build, commission and maintain the hardware, known as Automated Storage and Retrival Systems. This wasn’t the first venture for Bilstein Group with Witron as a smaller operation had been commissioned elsewhere on the Ennepetal site a few years previously. That first project was a four-aisle tote (as the crates that are used on such systems are known) picking solution proved to be extremely successful and is still in operation. Given the success of the first project, the new machinery was ordered and put into commission around five years after the first. It is one thing to describe an automatic warehouse on paper, but it is entirely different to see it running in front of your eyes. As you can see in the stats, the main part of the warehouse is much higher than is usual, as there is no need for regular fork lift trucks because robotic cranes are built in to each aisle and can access each tote location as quickly and as easily as finding a cell on a spreadsheet. There can be no people inside the aisles while the machine is running – indeed there can’t be because an automatic stop is built into a high metal gate that prevents anyone getting too near the hardware. This meant that the robots can run at very high speed in safety across the grid of 227,000 double-deep tote locations. Another point to note is the lights – or lack of them. These installations are often referred to as ‘dark warehouses’ because there is no need for artificial light, and in this case the large storage space really does look like night. An algorithm dictates the location of each tote-contained item and this will be automatically updated if the order frequency changes for example. There is no need for human intervention. Alongside the tote picking machinery, there is a row of machines dealing with palletised storage. Using a similar logic system, there is room for some 61,000 pallets also stored double deep. 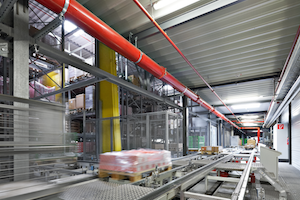 After the robot has selected the pallets, they roll on conveyors to modular packing stations known as ‘pick to light’. A (human) picker takes the number of items displayed on a lightbar in front of them out of the pallet. They then push a button and the pallet rolls away for the machine to take it back to its storage location, while the next pallet is dispatched to the picker. 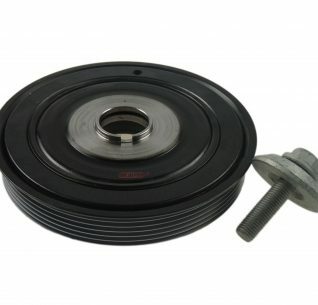 Another major part of the business is repacking bulk products into kits – timing belt kits, for example. 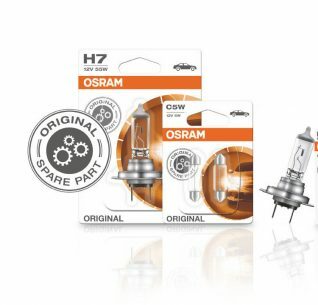 As anyone who as ever been on the tools will testify, there is nothing more annoying than finding at the critical point that there is an incorrect or missing part from the kit. At Bilstein, automation has meant that this is all but impossible as the system weighs each kit for any discrepancies. There’s no need for the workers to go rummaging around for the parts needed to make each kit either, as the tote-picking machines mentioned earlier deliver all the crates needed to a number of stations in a process known as ‘goods to person’. After picking the items needed, the product tote zooms away on the rollers, to be followed by the next tote until the order is complete. There is much more that could be written about the details of an automated warehouse, and this is only a brief insight as we saw and understood the machinery – undoubtedly a representative of the company could do a much better job of explaining it’s intricacies. Fortunately, you may get to see a similar system in the UK as Bilstein Group has commissioned similar equipment to be installed at its new project under construction in Markham Vale. We look forward to bringing you the full details soon.